This script allows you to open point exchange stores. If you have visited a fair or have played games like Pokemon where you could earn points at a casino, then you know what I'm talking about here. 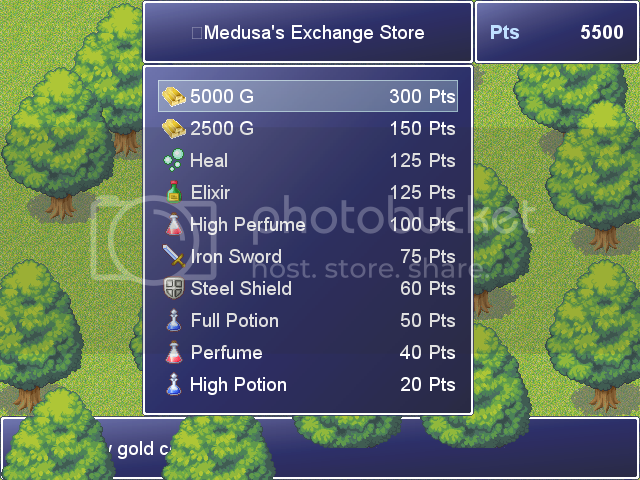 Players may get either gold, items, weapons, armors or skills at the store. Since Mangostan version 1.5.2 it also includes the Elite Exchange Store feature that lets heroes earn Elite Points if their team achieved an Elite Status only. There are some TXT files you need to edit so you can configure the prizes, gifts and additional prizes. Designed for RPG Maker XP only. Free for use in non commercial projects. Due credit is not optional but a must. Updated script to fix a bug that didn't let the store to properly update its goods list after spending an specific amount of exchange points. I haven't really taken a look to see if it's something I could fix myself (although I'm not good at scripting), but either way I figured you would probably want to be made aware of it. There was just a Maracuyá version in the English directory but I already uploaded the new Mangostan version. Before this happened one could only find the Spanish version of my script. You should also know that I won't support old versions of KyoPrizeShop anymore. Yeah I figured it was only worth mentioning if you're still supporting the script, and when a thread is six months old it can be pretty hit or miss. I got a chance to take a look at it today and it seemed to be a pretty easy fix anyways (removing the tileset priorities from class Scene_KyoPrizeShop seemed to do the trick).